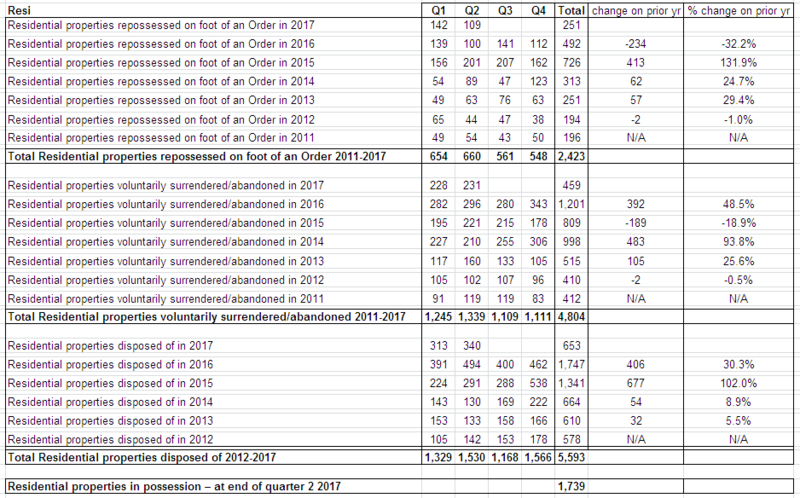 The figures, quite bizarrely, showed there were small numbers of mortgages given out by the main banks on interest-only period lasting until 2036! In a BTL situation these would have been extraordinary financial rewards to people. Their monthly repayments would have been tiny, yet they could collect market rents. Eventually when the mortgage ends, they would still owe the full loan. However house prices would have had decades to recover and they could just sell on the investment property having bagged the profits for years. The figures also showed around €70m of principal private dwelling mortgages on interest-only until 2036. Just when you think nothing more can amaze you about the Irish mortgage market you discover that the banks were giving out 30 year IO mortgages!! Extraordinary! Sean O’Rourke had a report from a reposession court the other day with some extraordinary details. The reporter spoke to a man who lives in West Cork, is 61, and in 2008 got an interest-only 29 year-mortgage with Pepper for €400k at something between 7% and 8%! Apparently the repayments were €3k from day one. His business has gone south and his health has suffered and he looks like he’s going to lose the home. Usually in these cases there was stupidity on the part of the bank and the lender equally. I’m normally sceptical of those who claim ‘reckless lending’ but in this case my sympathy is entirely with the customer. Aaaaaahhhhhh, dreamy “West Cork”. Where all the “very best people” live. Near the sea, best attitudes, a great place to retire. Sea air and lots of coves and inlets for bathing pleasures. I’m afraid that yes, he might have the loose his house if he cant’ afford it. Some people want it all but don’t want to pay for it. Living the dream! with Pepper for €400k at something between 7% and 8%! Apparently the repayments were €3k from day one. Living the dream , yes. But surely there should be some kick back against the numptys who gave out a loan like that. They’re supposed to be the educated lot! I don’t think he’d have been with Pepper in 2008, they entered the market in 2012, so I guess he got a GE Capital sub prime loan. 3k on 400k is 9%, I’d expect his repayments of 7.5% to have been closer to 2k than 3k. Maybe he means he’s got the rate at between 7-8% and it rose shortly after he got the loan or GE Capital weren’t the most upfront on the overall cost to their clients. ECB rates were 4-5% for most of 2008 so interest only might well have been 7-8%. His problem wasn’t so much the rate but more that he shouldn’t have got a loan of that size. But surely there should be some kick back against the numptys who gave out a loan like that. They’re supposed to be the educated lot! Rugby educated maybe… anyway having to sell on the loan at a 50% loss is a bit of a kicking. Vulture funds have received a massive blow in their attempts to repossess homes. It has come about because a second lender was forced to admit it was incorrectly calculating arrears levels on mortgage accounts. This latest admission sees Tanager forced to withdraw legal proceedings against a number of property owners in arrears. The development is set to cast doubt over future moves by Tanager to take repossession actions against those behind on their repayments. It comes just two months after subprime lender Start Mortgages had to stop repossession proceedings after it emerged it has been miscalculating the arrears on accounts. Tanager, a US fund that bought Bank of Scotland mortgages, is now recalculating how it works out arrears on accounts. Owned by Apollo in the United States, Tanager snapped up more than 2,000 distressed home loans from Bank of Scotland Ireland in 2010. Financial experts said other funds that bought mortgages were now likely to be forced into admitting they have been miscalculating arrears levels, which will force them to withdraw repossession cases. In letters sent to mortgage holders, Tanager, through its mortgage servicing agency Lapithus, has had to change how it calculates arrears. 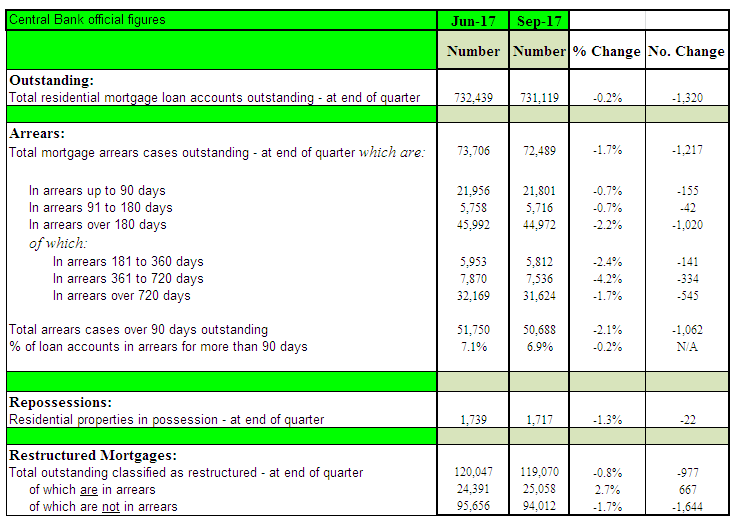 Up to now it has been adding the arrears amount to the overall mortgage balance, so-called arrears capitalisation. This inflated the monthly repayments. Compensation for the distressed borrowers too perhaps and being put through the tress of it all? Thousands of people stopped paying their mortgages once they knew their houses wouldn’t be repossessed. A Central Bank report has found a direct link between an increase in the number of people going into arrears and a High Court judgment which blocked banks from reclaiming homes. In 2011 a High Court judge made a ruling to block the repossession of homes. This was based on a legal loophole which was addressed two years later. A new report from the Central Bank has found that during this time, people stopped paying their mortgages. The Irish Independent reports that some of these people could have continued to pay, but chose to go into arrears instead, because they knew they couldn’t be evicted. 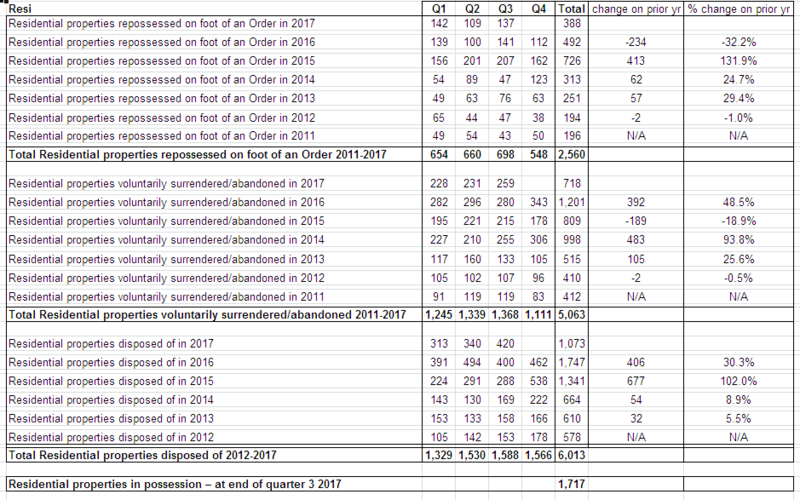 The Central Bank report has found a direct link between the High Court judgement and an increase in the number of people defaulting. Ireland has some of the highest mortgage debt in Europe with almost 51,000 residential mortgages more than three months in arrears. Newstalk breakfast had Brendan Burgess on to discuss this. And while Paul WIlliams called it a ‘revelation’, BB simply said that this comes as no shock to him or anyone who looked at Irish mortgage arrears. He also pointed out that the difficulty in repossessions is what makes foreign bans stay out and in part causes the Irish banks to charge such high interest rates…if Mr X isn’t paying his mortgage, then Mrs Y and Mr Z will be hit by the banks to cover that loss. David Hall on Radio 1 now saying that at the end of the day Central Bankers are essentially bankers and what would you expect from bankers only a report like this. And have they nothing better to be doing. But but Ireland is different. An Irishman always pays his debts. Or was that the Lannisters ? I think most of us are with Brendan there. I’m more surprised if someone is surprised by this. This CB report is headline news on Newstalk all morning and has featured on all their radio shows so far today. It’s coming up on the Ciara Kelly show later when David Hall will rage some more. But it’s getting very little traction on RTE. It’s not on their radio news bulletins, not on their website and got a brief mention on the SOR show. That is very interesting. Any idea if either have an agenda? Hall on NT now saying exactly that - this just proves that the majority continue to pay their mortgage! Halls on NT to trumpet his latest deal…this time with PTSB. Mortgage to rent…his group will buy the house at a whopper discount and you’ll pay means tested rent at the average LA rent of €45 per week. Your debts written off. You can buy back the house in the next 30 years at the rate that Hall paid today! Buy it back with the cash you salted away while paying a menial rent. That this scam gets no opposition whatsoever tells us so much about the state of Irish society. Haughey would be embarrassed pulling a stroke like this.